We consider an Applicant Tracking System (ATS) to be the centrepiece of any effective hiring toolkit. This is why we built one from scratch and obviously consider it to be the best of its kind. 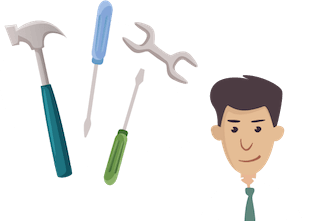 When choosing an ATS ask yourself how well it integrates with other tools that you’ll need. A good one will integrate or at least play nicely with most of the software we recommend below. TalentBin , Sourcing.io , 3Sourcing and Gild are people aggregators with searchable, often pre-evaluated or classified profiles of people. Professional networks or communities like LinkedIn, GitHub, Dribble, AngelList are good places to do manual sourcing. Zao is one of the best referral platforms we came across. It’s made based on best practices, optimises matches across all companies’ open jobs, has a gamification layer making it fun to participate and allows extended referrals. Another one to consider is RolePoint. Kira for us is the clear leader. Interviewing has gone video and this lets you record video questions, invite candidates to submit their responses so you can review them. Set time limits for responses, pause to take notes, tick the ones that are a perfect match, share if you’re not sure to take a second opinion. Taketheinterview is a one of a kind real-time or on-demand interviewing platform. “Meet eye-to-eye before meeting face-to-face” as they put it. Features include calendar, mobility, recording, feedback and assessment module and reporting. Codility is a niche, engineers-only, database. These guys are loaded with millions of engineers -- active and passive. Considering the gap between demand and supply then this app is an trove of prospects and a pretty straightforward tool to use if tech job boards aren’t cutting it. 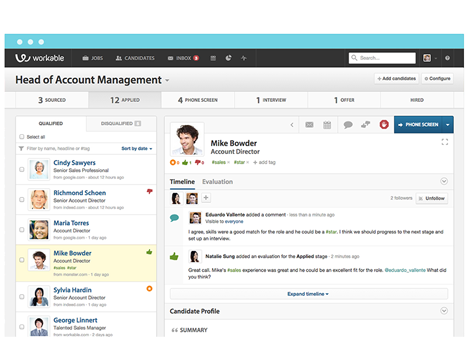 You can browse and filter data, collaborate with your team and do social recruiting too. Smarterer have revolutionised skills assessment. Just give them 10 questions, 2 minutes and voila! you get a quantified skill. It’s basically a skills testing app but different. All of its test content is crowdsourced from the individuals who take the tests. SHL has ability and personality tests if you need to test for critical qualities. They only offer science-based assessments and benchmark data. Weirdly has your cultural fit riddle all figured out. It’s a four-step culture assessing recruitment tool. Define your desired cultural profile, publish the vacancy, watch candidates complete the quiz and select the right kind of weird. KinHR is probably the best when it comes to onboarding new hires in a comprehensive and thoughtful way. The new employee signs in and reads about the company and the team they’re going to work with and what tasks they should start working on. Zenefits is good for payroll and benefits management. PRO TIP: You can always use Google Hangouts for video interviewing and Bitly for referral tracking. Where does the rest of your industry (in your city or country) post jobs? Did you get enough qualified candidates the last time you hit publish on XYZ job board? Did you get any candidates at all? Did you get too many candidates, maybe? Ask people who already have this type of job, where they first saw it? Visit alexa.com to see how popular the job board you are considering is. To facilitate the job board selection process, we brought together a handy list of the top ones (below). LinkedIn is the leader due to its three-way nature; professional social network + headhunting tool + job board. The biggest of its kind with 300m+ members/candidate pool. It enables you to search profiles, pay to post jobs and more besides. Indeed is the premier job site globally with 4m positions. You can post all types of jobs, sponsor the ones from your careers page, pay per click and search resumes. Craigslist the site for classifieds. Doesn’t match the traditional job board criteria, is famous for it’s poor user interface but beats everyone for inbound traffic. Monster one of the oldest job boards that keeps expanding worldwide. It’s a bit expensive in some countries (unless you post through Workable ), has a lot of traffic and loads of resumes and free content. Careerbuilder operates in the US, Europe, Canada and Asia. Twenty-four million visitors per month and the 92% of Fortune employees posting their job openings. Stepstone is one of the most successful job boards in Europe, especially after partnering up with TotalJobs (UK). Beyond automatically distributes postings to niche sites and talent communities based on specific criteria. What’s in it for you? Targeted exposure and more relevant applications. Careers 2.0 is powered by Stackoverflow. If you’re looking for developers, it’s the place to go. Some 25m devs and technologists use it every month. Dice is also one of tech job boards industry leaders. Has a cross-posting network and minimizes unqualified clutter due to its niche nature. Github Jobs taps into developers and engineers by being the place they hang out. Good place to trawl for passive candidates. Behance is where some of the top brands post their creative jobs. It’s also the place where professionals showcase their work enabling you to take a sneak peek before you decide. Dribbble gives you access to designers’ portfolios and profiles. Workable’s designers are really fond of it. Plus you can post your jobs and connect with top talent. We Work Remotely is the job board without borders allowing you to narrow down talent without it having to be in the same location as you. Upwork is free and for freelancers only. If you’re looking for one, check out their well-rounded freelancers’ database. Flexjobs is free and effective when it comes to flexible jobs job posting. Only applies if you’re in search of part-time, telecommute or freelance employees. Angelist ‐ you probably already know it if you’re a startup. Candidates get to apply privately and see salary and equity up front and startups get to access a huge list of developers and designers actively looking for a job. On top of that, it’s free! Startuply is a free job listing site aimed mainly at small startups, which find it rather difficult to attract engineering talent. Startups can create a detailed company profile to give prospect candidates a sense of what it’d be like working for them. You should definitely give it a shot. StartUpHire lists hundreds of jobs, but only for venture capital backed companies. It also comes at zero cost and has a widget that enables you to automatically add your open positions to your website. The Muse , lets job seekers look behind the curtains of great companies. You can “showcase the heart and soul of your company” in 500 words, videos and photos and then display your job openings.